By Jon Tewksbury Posted: November 21, 2018 9:45 a.m. 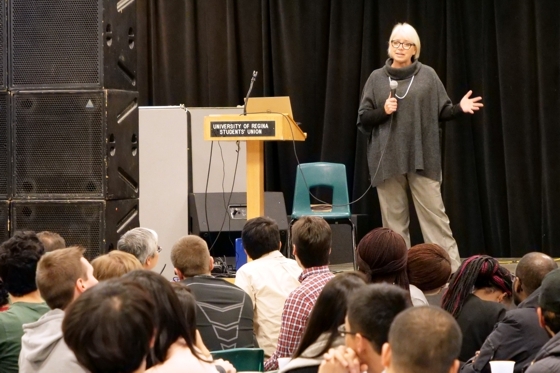 The inaugural Petroleum Systems Engineering Week officially kicked off on November 19 to a packed room of eager students who were treated to a complimentary meal, along with a generous helping of wise words. 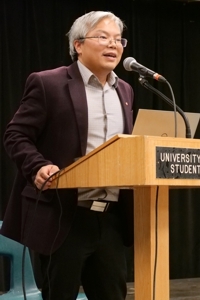 Dr. Fanhua (Bill) Zeng, associate dean, Faculty of Graduate Studies and Research, and program chair, Petroleum Systems Engineering, is organizer of the first-time week-long celebration of engineering and industry. He welcomed the students to the dinner and reception and offered his valuable (and hard-earned) insights to the future engineers. Dave Button, Vice-President (Administration), also spoke at the dinner, touching on the importance of the industry, and the importance of student involvement. Adding to Button’s remarks, Dr. Esam Hussein, dean, Engineering and Applied Science, noted that the petroleum industry can ebb and flow, but that it shouldn’t discourage future engineers from working in the field. Monday’s keynote speaker was Heather Quale, President, Mera Group of Companies. She noted that having an engineering degree is a valuable investment for a student’s future. PSE Week continues through November 23. High school and university students are encouraged to attend. Events are free, but students must register.